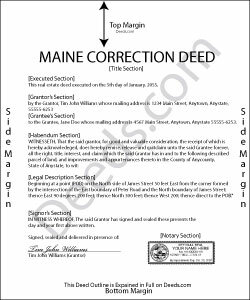 Use the corrective deed to correct an error in a previously recorded deed of conveyance in Maine. Correcting an error in a recorded deed helps prevent problems that might arise when the current owner attempts to sell the property. The best method for correction is prepare and record a new document, a so-called corrective deed. This document does not convey title; instead, it confirms the prior conveyance of the property. Apart from supplying the correct information, the new deed must state the reason for correcting and reference the prior deed by title, date, and recording number. It must be signed by the original grantor, confirming the earlier conveyance to the original grantee. When correcting the legal description, both the grantor and the grantee should sign the corrective deed to avoid any doubt regarding the conveyed property. For certain types of changes, however, a correction deed may not be appropriate. Adding or removing a grantee, for example, or changing the manner in which title is held, or making material changes to the legal description, especially deleting a portion of the originally transferred property, may all require a new deed of conveyance instead of a corrective deed. When in doubt about how to correct an error, consult with a lawyer. Donna B. said: Really liked the quick access to documents. Great service, thanks. Reply from Staff: Thank you Donna, we appreciate you taken the time to leave your feedback. Have a great day! Terri A. said: So far so good --- I'm helping a friend with her property! Thanks! Reply from Staff: Thank you Terri.